Coming to Windows 8.1 Update 2, or Windows 9? 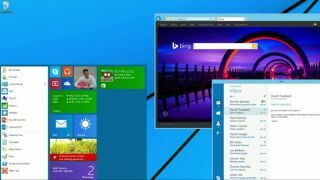 An anonymous leaker claims to have lifted the lid on the latest version of Microsoft's 'classic' Windows 8-style Start menu. Microsoft provided a glimpse of its redesigned Start menu at Build 2014, so the leak - if it's not an elaborate Photoshop job - is hardly going to win coup of the century (even if it will stir fire in the bellies of 'classic' Windows die-hards). Posted on MyDigitalLife, it largely falls in line with what was shown off back in April, combining Windows 7's traditional list of programs on the left-hand side with Windows 8-style live tiles on the right. The only difference appears to be larger live tiles, which may indicate the ability to customise tile sizes with a right-click, like you can on Windows 8, RT and Windows Phone. Or, you know, Microsoft may have just wanted to make them a bit bigger. Speculation is fun, right? Tech pundits have offered mixed receptions on the image's authenticity. The Verge's Tom Warren reckons it's "likely to be a giant Photoshop bomb", whereas sources close to Microsoft apparently told Neowin that the screengrab is the real deal. Whichever is true, the new Start menu isn't likely to appear in its final form until 2015, according to reports, which point to Microsoft saving it for the next major Windows release that will eventually emerge from the chasm as Windows 9. What else do you know about Windows 9?